As people who work a lot with their hands, it’s always great to find the right tool for the job. Sometimes when you are doing electrical work and interacting with a lot of wiring, you need to occasionally strip the wire’s Romex electrical coating in order to expose the undamaged core of the wire. After the stripping is done, you can then connect the stripped cores to a terminal or to another wire, completing the circuit once current is returned. The best way to do this type of work is to utilize a wire stripper, which happen to come in several different types. 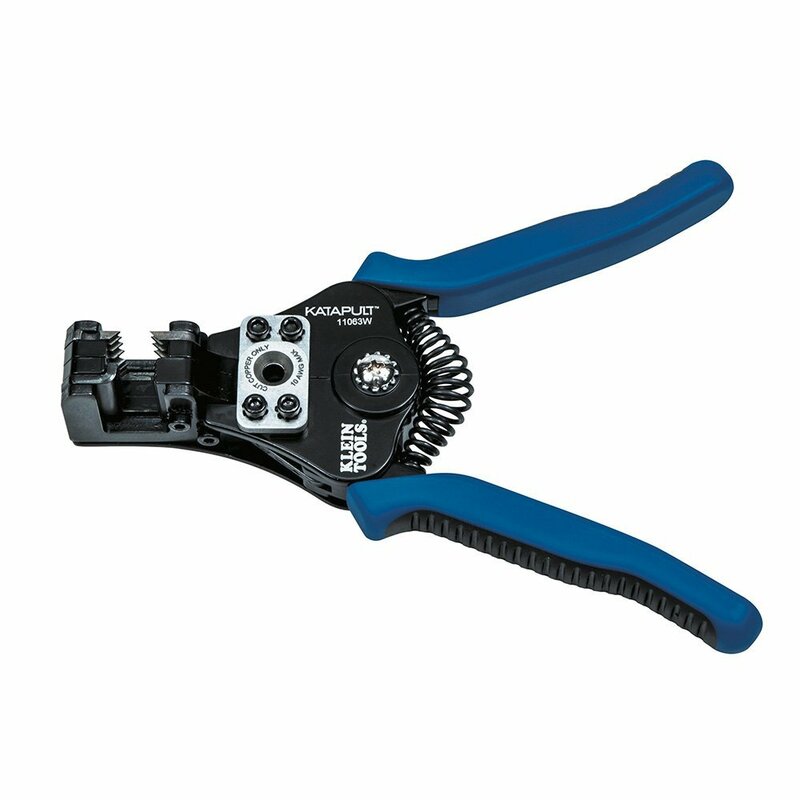 To make things easier, we’ve identified several great wire stripping tools and also composed a set of considerations that you can take a gander at before you make a decision on a new tool. If you are looking for a wire stripper that is backed by one of the most trusted manufacturers in the world of tools, then look no further than Klein Tool’s Katapult wire stripper. Klein Tools has been crafting work site ready tools since 1857 when German immigrant Mathias Klein created the company to craft hand tools that telegraph linemen could use to cut their lines. Since then, Klein has become one of the most widely used brands of tools used by workers in the telecommunications and electrical fields. This is a complex looking stripper. Firstly, as a compound style stripper, the Katapult has plenty of powerful-looking parts that are designed to strip several types of wires, each of different gauges. There’s a large coil spring at its base, and the two blue handles are made of a rubberized material that is super easy to grip because they are so ergonomic. To ensure a steady grip that won’t allow for the type of dangerous slippage that could destroy the wire you’re working with, this stripper employs a ridged grip on the outside, so that you can manage the tension accurately. The metal parts of this tool are comprised of a cast alloy chassis, which is very hard to damage, even when exposed to the typical rigors of an active worksite. Have a job to do that’ll see you working with variable gauged wires that are both stranded and solid core? Then, this is the perfect device for the job. You simply load the wire into the tension loaded wire grip and clench the ergonomic handles to strip the wire of its insulated coating. The strip is clean and even, allowing you to attach the exposed wire to whatever terminal or other wiring you need with little to no fuss. Need to start over with your strip? Another function of this set of wire strippers can be found in the center of the device. In this area, you’ll notice a rectangular section that has a hole in the middle. Simply lead the wire you need to start over with into this hole, squeeze the handles and the wire will be cut via the stripper’s dedicated wire cutter. Most users who have experienced this Klein Tools product stand by its ease of use and overall usefulness. Since Klein is a brand depended on by many electricians and tradesmen, it’s no surprise that this device was awarded our Gold Pick status; simply put, this is a device that will get the job done and will last you through years of continuous wire stripping. Irwin Industrial is another American company that originated in the 1800s when tools of this type were in their nascent stages of development. Starting out as the business venture of an Ohio-based pharmacist, this now-iconic company started its history when said pharmacist purchased the rights for an auger bit. Since then, Irwin has become a famous brand for drill accessories, locking pliers, and power tool accessories. After getting to know the compound stripper that is our Gold Pick, the first thing you’ll notice is how much our Silver differs from its design. This tool is part of Irwin’s Vise Grip line of products, and aesthetically, you’ve never seen a more work ready-looking tool. Its grips are yellow and blue, and they are large enough to grip sturdily and securely. 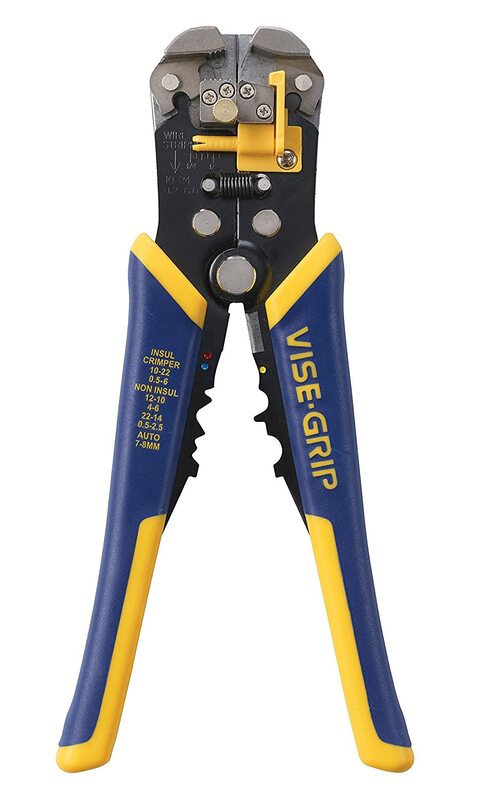 They have the Vise Grip logo emblazoned on them and have a tapering, ergonomic outer surface that’ll ease some of the fatigue that comes naturally when using a set of wire strippers. When it comes to function, this is a self adjusting pair of wire strippers. What this means is that you can put any gauge wire into the main assembly of these tools and strip them equally. The way this works is fairly spectacular; inside the crimping area there is a high tension spring which powers the stripper’s functionality. On the top of the stripping area there are two nickel chromium steel grippers that automatically adjust to the thickness of the wire that you stripping; up to a ten gauge thickness. Once fed into the assembly, all you’ll have to do is quickly squeeze the handles and the stripping will be complete. Since this is an automatic device, you’ll find yourself stripping tons of wires at a very quick pace. You’ll never have to guess the gauge of what you’re trying to strip, and you’ll never get too tired stripping wires because the grips are specifically designed to reduce hand fatigue. Even though these strippers can handle really thick, washing machine level wire gauges, it does have some issues managing wires that have an excessive amount of insulation, so the knife might have to come out on this type of job. In addition to its excellent stripping system, you’ll also be able to find a quality wire cutter positioned opposite the stripper assembly. In addition to this, there are also wire crimpers underneath that, which will allow you to add blue, red, or yellow connectors to your wiring jobs. 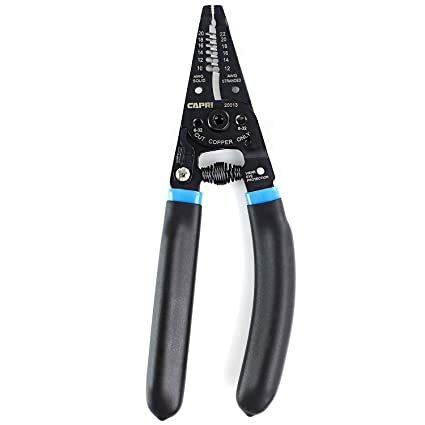 For the most part, many users really love the fact that this wire stripper is so easy to manipulate and many note that they can strip wires for an entire workday without experiencing much discomfort. Its speed of stripping is also a feature that many users enjoy, though larger gauges require a little more work to strip perfectly. Capri Tools is a much newer tool company than our previous manufacturers, but has over 30 years of experience producing tools that are designed to get the job done efficiently. Primarily focused on creating tools that can be used in the auto industry, the company still has an extensive line of electrician and telecommunication worker’s tools like their professional wire stripper and cutter. This tool has a simplified purpose and serves as the first gauge stripper in our guide. 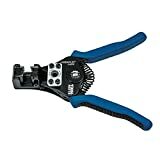 As a gauge type of tool, this wire stripper has a different look that is more reminiscent of a pair of pliers. It has two serrated “jaws”, has a high tensioned spring in the middle, and sports a curved handle that definitely has very similar shaping to pliers. Capri Tools added a degree of comfort to this grip, which is comprised of hardened steel that’s covered in a silicone sheath. This silicone sheath makes the grip easier to handle by adding extra cushioning. The handles themselves are irregularly shaped and uneven, ensuring that this wire stripper is ergonomic and easy to manipulate. For the most part, these tools are black in coloration, save for a light blue band at the top of the silicone sheaths. How does a gauge-type of stripper differentiate from the types we’ve featured thus far? Well, unlike the automatic or the compound strippers that served as out gold and silver picks, gauge strippers require a bit of manual adjustment by the user. The stripping assembly on these has several holes that are formed on each side of the stripper’s blades. You simply run the wire that needs to be stripped through the appropriate gauge hole, clamp down to secure it, and then pull the whole device outwards; removing the insulation. Since the nose has several gauge holes for both solid core and stranded wires, once you have stripped them, you can then bend them to whatever shape you need to make a connection with a wire or a lead connector. In addition to this, at the base of the jaws, you’ll find a wire cutter that will handle any gauge of wire; as long as it is copper only. In addition to all of this extra functionality, you’ll notice what appears to be a screw hole in the center of the stripping assembly. As you might have guessed, this area is designed to accommodate screws of 6-32 and 8-32 dimensions. Simply squeeze the handle as if you were stripping, and the blades in this screw assembly will shear screws of these types down to size. While not an automatic stripper, many technicians find that the added plier functionality of this stripper is really useful on jobs. Being able to bend wires to a needed shape makes the repurposing of existing wires a quick and easy process. Also, the screw shearer will also rethread a screw, so this is also a feature that many reviewers found to be very useful about this product. The cheapest you can go with a wire stripper is the difficult to adjust wire strippers that you can purchase at any hardware store. These types of strippers are annoying to use, and while they may get the job done, they also tend to add minutes to a job that should take seconds. Rather than spend a buck for these types, if you are on a budget, you should consider this pick. 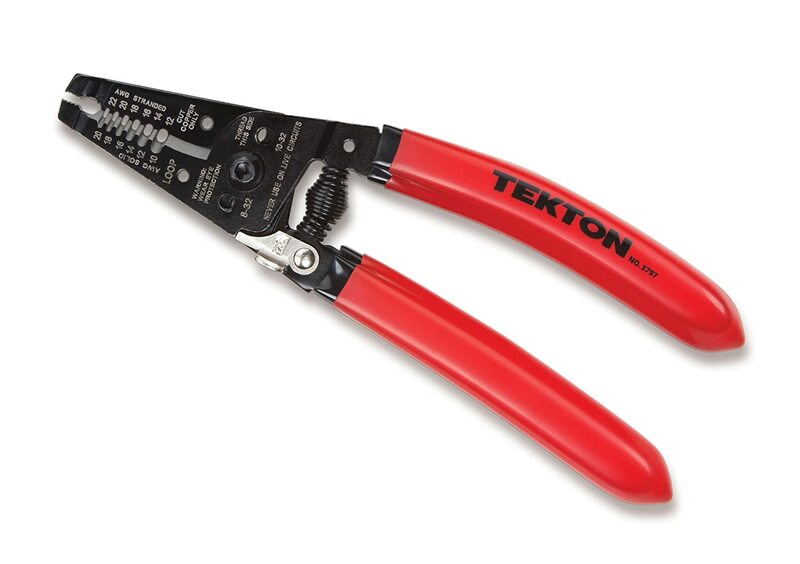 It is by Tekton, a tool company that is part of the Michigan Industrial Tools line that has a stated dedication to “those with a passion for simply great tools” and illustrates that dedication in this pair of wire strippers. Aesthetically, these strippers have a red handle that is easy to identify on a worksite and a steel construction that will ensure that they last for years. From a design standpoint, the first thing you’ll notice is that this is another gauged wire stripper. As a matter of fact, this ballin pick bears a few design similarities to our previous wire stripper. It features the same silicone coated, steel handle, it features a strong, high tension spring in its middle section, and it also has screw shearer that cuts screw sizes #8-32 and #10-32. This similarity isn’t a major negative for this stripper, these features are very valuable on the worksite, but this gauge wire stripper comes in at a lower price point than our Bronze Pick. Additional features that you’ll like with this stripper are the dedicated loop holes set into the blades of this tool. These loop holes make it even easier to shape the wire that you’re cutting to your specifications. Simply run the wire through, and twist the stripper like a pair of pliers until it fits your needs. 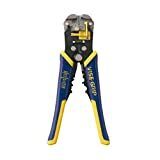 Many of the professional reviewers who have used this wire stripper have reported that they were pleasantly surprised that these weren’t flimsy and cheap feeling. This high quality construction, coupled with the lower price point make this tool the perfect item to distribute to your crew when they need to handle a lot of wiring. Also, many reviewers relished the amount of cushioning that Tekton used in the silicone grips, as this made the work that was done much less fatiguing. When you need to strip a wire, you have a few choices that will allow you to remove the casing with varying success. Assuming you don’t want to use a knife, or less intelligently, your teeth, let’s take a look at some of the options you have when it comes to wire stripping technology. • Cheapo: Everyone has seen a pair of cheapo wire strippers at some point in their lives. These simple devices tend to cost about a buck and they do a fairly decent job at getting some wires stripped, but it definitely take a bit of physical effort to adjust the cutter to the write gauge and it’s also really easy to accidentally shear the wire with this type of wire stripper. With this type of device, your margin of error is absolutely miniscule; mess up by about 0.5mm and you’ll either not strip close enough or damage the wire. • Gauged: With these types of wire strippers, you’ll have several gauge holes to pick from; each representing a different gauge of wire. To operate, simply select the appropriate gauge, insert the wire, and pull it through. No fuss no muss. This is a simple type that you won’t need to second guess much or adjust to strip a certain wire. • Self Adjusting: These types of wire strippers are great for getting a nice even strip, though some can leave small nicks in the wire if you’re not careful. To strip, simply place the wire inside the grip of the device and lock it in. Then, simply open up the handles of the stripper and the area of wire in the center of the device will be stripped. Some devices also include wire cutters in the center that will help you through the next step easily. • Gauged Automatic Wire Stripper: This type combines the prior two types, so that you have self-adjustment as well as gauge selectors. This is unfortunately the more expensive type as well, but most professionals tend to like this style over the others. You simply run the wire through the gauge selector and squeeze, even the cutting jaws can be replaced when they lose sharpness. • Solid core: This contains one solid piece of copper wiring in the center of the wire, which is sometimes referred to as a strand. This type of wire is bendable, but not really designed to be moved often. You can wrap this wire around a connector for a solid connection, but you’d never want to use this type of wire in a constantly moving piece of machinery like what you’d find in an industrial robot arm. • Stranded Wire: This is the type of wire that you’d use if you needed flexibility and pliability. Typically, this type of wire is comprised of many metallic or copper strands that pass current from one end to the other. As a rule, it’s hard to pass this type of wire through a breadboard because of all the disparate strands. Just like with any other hand tool, ergonomics are very important. 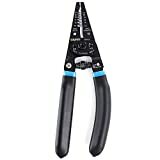 Wire strippers are similar to pliers as they both require a consistent squeezing motion that can wear on your hands if there aren’t enough ergonomic concessions. This consistent gripping requires a ton of forearm strength and this is particularly stressful for arthritis sufferers. Fortunately, some tool manufacturers have created devices that require less tension to operate. With these types, you’ll be able to find strippers that requires as little as 1/3 of the force needed to operate some of their competitors. When your hands are less fatigued, you’ll find that you’ll get much more wire stripped over the course of your day. The bottom line is, sometimes you’re going to find yourself stripping wire in some really tight situations. When reaching down to strip wire that is embedded in your walls, you’ll sometimes need a device that has a form factor that will fit in hard to reach places. Some of these are simply smaller, while others have tilted handles that will allow you to get the work done with aplomb. When selecting a new device, try and look into what options it has for reaching into those hard to reach areas, down the line, you might really thank yourself for getting a more maneuverable tool. Whether you’re an electrician or someone who is doing amateur wiring work on your home, it’s great to have a good, maneuverable set of wire strippers to help you with the work that needs doing. The products that have been featured here are perfect for getting the job done smoothly and quickly, and each option represents a brand that has gained a lot of trust in the professional community, so you know that whichever you do pick, it’ll last you for years and be reliable. Also, if you’re relatively new to the world of wire stripping, be sure to do some research before you go out there and do wiring work. Don’t neglect to use our pre-purchase section to find a device that is not on our list, if you think that’ll help net you a lifelong tool.